Jawaharlal Nehru Technological University (JNTU) 1, Hyderabad - 500085, Telangana, India. Department of Pharmaceutics 2, V. L. College of Pharmacy, Raichur - 584103, Karnataka, India. Department of Pharmaceutics 3, The Oxford College of Pharmacy, Bengaluru - 560068, Karnataka, India. ABSTRACT: The aim of this investigation was to design and optimize the Capecitabine niosomes derived from proniosomes using central composite design. Two independent variables viz., the molar ratio of drug to cholesterol (X1), surfactant loading (X2) and two dependent variables viz., the percentage drug entrapment (PDE) and mean volume diameter (MVD) were selected for the study. Proniosomes were prepared by a conventional slurry method and evaluated for the percentage drug entrapment (PDE) and mean volume diameter (MVD). The PDE dependent variables and the transformed values of independent variables were subjected to multiple regressions to establish a second order polynomial equation. Contour plots were constructed to elucidate the relationship between the independent and dependent variables further. 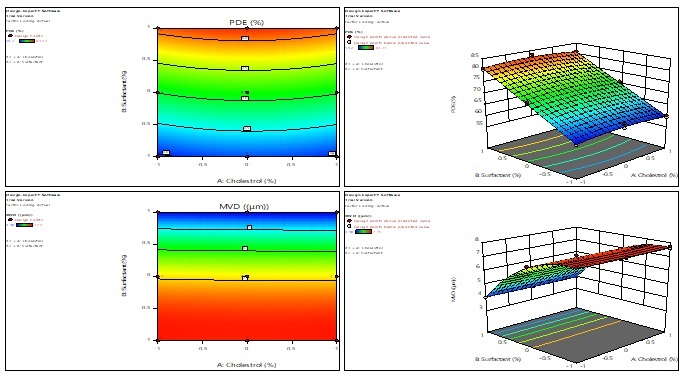 From the computer optimization process and contour plots, predicted levels of independent variables X1, X2 (-0.77, -0.8 respectively), for an optimum response of PDE with constraints on MVD were determined. The polynomial equations and contour plots developed using central composite design allowed us to prepare niosomes derived from proniosomes with optimum responses. INTRODUCTION: Most of the active pharmaceutical ingredients currently available in the market and those under development have poor and variable bioavailability. This problem can be overcome by entrapping the drug into niosomes. Niosomes are non-ionic surfactant vesicles that can entrap a solute in a manner analogous to liposomes. They are osmotically active and are stable on their own, while also increasing the stability of the entrapped drugs 1, 2. Handling and storage of surfactants require no special conditions. Niosomes possess an infrastructure consisting of hydrophilic and hydrophobic moieties together and as a result, can accommodate drug molecules with a wide range of solubilities 3. Although, niosomes as drug carriers have shown advantages such as being cheap and chemically stable, they are associated with problems related to physical stability such as fusion, aggregation, sedimentation, and leakage on storage. All methods traditionally used for the preparation of niosomes are time-consuming and may involve specialized equipment. Most of these methods allow only for a predetermined lot size, so the material is often wasted if smaller quantities are required for particular dose application 4. The proniosome approach minimizes these problems as it is a dry and free-flowing product which is more stable during sterilization and storage. Ease of transfer, distribution, measuring, and storage make it a versatile delivery system. Proniosomes are water-soluble carrier particles coated with a surfactant, which can be measured out as needed and hydrated to form niosomes immediately before use on brief agitation in hot aqueous media 5, 6. Capecitabine is a prodrug of 5'-deoxy-5-fluorouridine (5'-DFUR) Fig. 1, which is enzymatically converted to 5-fluorouracil in the tumor, where it inhibits DNA synthesis and slows the growth of tumor tissue 7, 8. It is an orally administered chemotherapeutic agent used in the treatment of metastatic breast and colorectal cancers 9. In the present research work, the conventional slurry method was used for the preparation of Capecitabine niosome derived from proniosome and optimized. The proniosomes are thus needed to be optimized for the desired response; many statistical experimental designs have been recognized as useful techniques to optimize the formulation and process variables 10. Different types of experimental design include 3-level factorial design 11. D-optimal design 12, Box Behnken design and central composite design 13. Central composite design requires fewer runs in a 3-factor experimental design and hence was selected for the present research work. The independent variables selected for the present study are the molar ratio of drug to lipid (X1), surfactant loading (X2). The dependent variables included are PDE and MVD of niosomes derived from niosomes. The optimization is done using Design Expert 11 (Trial Version 11, Stat-Ease Inc., and Minneapolis, MN) to interpret the results and easy scale up. Materials: Capecitabine gift sample was obtained from Shilpa antibiotic Pvt. Ltd., Raichur. Maltodextrin was procured from Himedia, Hosur, cholesterol, span 40 and DCP (Dicetyl phosphate) were purchased from Loba chem Pvt. Ltd., Mumbai. All the other ingredients and reagents used were of analytical grade. Where Y1 is the dependent variable while b0 is the intercept; b1 to b33 are the regression coefficients; and X1, X2 are the independent variables levels of which were selected from the preliminary experiments. Preparation of Proniosomes: The proniosomes were prepared by the slurry method 14. 250 µmol stock solution of span 40 and cholesterol was prepared in chloroform: methanol (2:1). The accurately measured volumes of span 40 and cholesterol stock solutions and Capecitabine (50mg) dissolved in chloroform: methanol (2:1) solutions were added into a 250 ml round bottom flask containing previously 2 g of maltodextrin powder used as the carrier. Additional chloroform: methanol (2:1) solution added to form a slurry. Further, the flask was attached to a rotary flash evaporator rotated at 60 to 70 rpm. The solvent is allowed to evaporate at a temperature of 45 ± 2 ºC in a reduced pressure of 600 mm/Hg until the mass in the flask had become a dry, free-flowing product. The obtained proniosomes powder was further dried overnight in desiccators under vacuum at room temperature. The obtained dry proniosomes powders were stored in airtight amber colored vials kept in a refrigerator for further evaluation. These proniosomes were used for the preparation of niosomes and characterization of the surface characteristics by scanning electron microscopy. Proniosomes were transformed to niosomes by hydrating with phosphate buffer saline (PBS) with a pH of 7.4 at 80 °C using vortex mixer for 2 min. The niosomes were sonicated twice for a specified time using a 250W probe-type sonicator (MAGNA-PAK-250, Libra Ultrasonic, India). Niosomes were prepared in such a manner that total surfactant concentration remained at 10 mmol in all the batches. Niosomes were characterized for morphology, PDE and vesicle size in terms of MVD. Scanning Electron Microscopy: Proniosomes were sprinkled on to the double sided tape that was affixed on aluminum stubs. The aluminum stub was placed in the vacuum chamber of a scanning electron microscope (XL 30 ESEM with EDAX, Philips, Netherlands). The samples were observed for morphological characterization using a gaseous secondary electron detector (working pressure: 0.8 torrs, acceleration voltage: 30.00 KV) XL 30, (Philips, Netherlands). Optical Microscopy: The hydrated niosome dispersions prepared from proniosomes were observed using optical microscopy. After suitable dilution, the noisome dispersions on a glass slide and viewed by a microscope (Medilux-207R (II), Kyowa-Getner, India) with a magnification of 1200X. Percentage Drug Entrapment: The entrapped Capecitabine within niosomes was determined after removing the unentrapped drug by dialysis 15. The dialysis was carried out by taking niosome dispersion in a dialysis tube (donor compartment), which was dipped in a beaker containing 400 ml of PBS with a pH 7.4 (receptor compartment). The beaker was placed on a magnetic stirrer run for 4 h with a speed of 80-120 rpm. Then, the solution inside the receptor compartment was studied for unentrapped capecitabine at 303 nm using a UV spectrophotometer (UV 1601, Shimadzu, Japan) 16. The PDE in the niosomes was calculated from the ratio of the difference of the total amount of drug added and the amount of unentrapped drug detected, to the total amount of drug added. Measurement of Vesicle Size: The vesicle dispersion was diluted about 100 times in the same buffer used for their preparation. Vesicle size was measured on a particle size analyzer (Laser diffraction particle size analyzer, Sympatec, Germany). The apparatus consists of a He-Ne laser beam of 632.8 nm focused with a minimum power of 5 mW using a Fourier lens [R-5] to a point at the center of the multielement detector and a small volume sample holding cell (Su cell). The sample was stirred using a stirrer before determining the vesicle size. Morphology of Dry Proniosomes and Niosomes Derived Proniosomes: Proniosomes were prepared by the slurry method using maltodextrin as a carrier. Scanning electron microscopy (SEM) of uncoated maltodextrin powder Fig. 2a shows the highly porous surface, which would provide more surface area to be coated with a surfactant mixture. Proniosomes were made with different proportions of drug and surfactant coating Fig. 2b, c, and d are SEM images of different proniosome batches made at different surfactant loading. The surface of the proniosomes batches F1 and F20, made at 1.5X and 3X respectively, was observed as being smooth and uniform while that of batch PA8, made at 4.5X surfactant loading was seen rough, thick and uneven. Morphology of proniosome derived niosomes was studied under the optical microscope. Niosomes prepared from proniosomes were spherical Fig. 3. The values of the coefficients X1-X2 are related to the effect of these variables on the PDE. Coefficients of more than one terms represent interaction and show how the response changes when two factors are simultaneously changed. Coefficients of higher order terms represent quadratic relationship and are included to investigate nonlinearity. The polynomial equation can be used to conclude after considering the magnitude of each coefficient and the mathematical sign it carries (i.e., positive or negative). The high value (0.98) of the correlation coefficient (R2) in the above equation indicates a good fit. Proniosomal batches F2, F4, F7, F8, F12, F14, and F17 exhibited high PDE value, i.e., more than 70% Table 2. A negative sign of coefficient for the molar ratio of drug: lipid (X1) and surfactant loading (X2) represents the antagonistic effect of these variables. In this study at different levels of X1, lipid was kept constant, and the amount of drug was increased for each level to give a different molar ratio. So at a low level of X1 high PDE value might be due to more availability of lipophilic ambiance for the drug entrapment. The significance of the different formulation variables and their interactions was compared using analysis of variance (ANOVA) at a significance level of P<0.05. From the P value for PDF analysis given in Table 3, it can be concluded that the molar ratio of drug: lipid have significant effects on the PDE of Capecitabine proniosome-derived niosomes and no interaction term has a significant effect on the PDE. The value of the correlation coefficient (R2) in the above equation was found to be 0.99, indicating a good fit. A positive sign of the coefficients for the molar ratio of drug: lipid and surfactant loading indicates favorable effects on MVD. Positive effects of X1 could be attributed to hydrophobic interaction between drug and surfactant. Favourable effect of X2 may be due to adequate hydration of the uniform and the thin film of surfactant at low surfactant loading compared to the film obtained at a high surfactant loading. As shown in Table 4, among the independent variables selected the terms X1 and X2 were found to be significant (P<0.05) in predicting the MVD. It is also evident from Table 4 that the quadratic effects of all the independent variables i.e. X12, X22 have significant effects on MVD. As the central composite design includes two center points, we can estimate the pure error of the experiments and enable the model’s to be checked for lack of fit. For the experimentally obtained data, the test for lack of fit did not yield statistical significance (P>0.05), and the results indicated that the models for PDE and MVD were satisfactory Table 3 and 4. Three-dimensional and Contour Plots: Presentation of the data as graphs can help to show the relationship between the independent and dependent variables. Fig. 4 is a contour plot drawn at 0 levels showing the effect of X1 and X2 on MVD and PDE of proniosome-derived niosomes. The contours for all the values of MVD were found to be nonlinear. It was evident from Fig. 4 that low value of MVD could be obtained with low level of both X1 and X2 and that high values of PDE (≥72%) can be obtained for different combinations of the two independent variables, X1 in the range of less than -0.8 level and X2 in the entire range of -1 level to 1 level. After studying the effects of the independent variables on the responses, the levels of these variables that give the optimum responses were determined. The optimum formulation is one that gives a high value of PDE (≥70%) and is constrained to a low MVD (≤ 5 μm) as well as having a high total amount of drug entrapped and low amount of carrier present in the resultant niosomes. Using a computer optimization process and the contour plots are shown in Fig. 4, the levels selected for both X1 and X2 were -0.77 and -0.8 respectively, which gives the theoretical value of 84.12% and 4.12 μm for PDE and MVD, respectively. Decreasing the level of X2 from the optimum level resulted in a significant increase in the amount of carrier but an insignificant increase in the PDE value. However, an increase in the level of X1 above the selected level led to an increase in the PDE value but as well an increase in the vesicle size above the desired value. Hence, -0.77 level of the molar ratio of drug: lipid (X1), -0.8 level of surfactant loading (X2) were selected as optimum. For confirmation, a fresh formulation was prepared at the optimum levels of the independent variables and the resultant proniosomes were transformed to niosomes and evaluated for the responses. The observed values of PDE and MVD were found to be 84.21% and 4.12 μm respectively, which were in close agreement with the theoretical values. CONCLUSION: The slurry method was found to be simple and suitable for laboratory scale preparation of Capecitabine proniosomes. The statistical approach for optimization of the formulation is a useful tool when several variables are to be studied simultaneously. The polynomial equations and contour plots developed by using central composite design allowed us to prepare proniosomes with optimum characteristics. ACKNOWLEDGEMENT: The authors are thankful to Shilpa antibiotics, Raichur, India for providing gift sample of Capecitabine and Principal, Management, teaching and non teaching staff of V. L. College of Pharmacy, Raichur for encouragement and support in carrying out the work. CONFLICT OF INTEREST: Authors declare that they have no competing interests. Gyati SA, Parveen KS and Abhay A: In-vitro and in-vivo evaluation of niosomal formulation for controlled delivery of clarithromycin. Hindawi Publishing Corporation Scientifica 2016; 1-10. Janel K, Rahul J, Praveena V, Aniket G, Shailee P and Prakash R: Targeting strategies for the combination treatment of cancer using drug delivery systems. Pharmaceutics 2017; 9: 46. Sharda S, Sarvesh P, Swapnil S and Bishambar S: Formulation of risperidone loaded proniosomes for effective transdermal delivery: An in-vitro and in-vivo Bulletin of Faculty of Pharmacy, Cairo University 2017; 55: 239-247. Aakash P, Siddharth A and Kirtesh R: Applications of maltodextrin in the pharmaceutical industry. Int J Pharm Bio Sci 2014; 4(4): 67-74. Hu C and Rhodes DG: Proniosomes: A novel drug carrier preparation. Int J Pharm 1999; 185: 23-35. Nasrul W, Sriwidodo and Insani UC: Characterization and optimization of natural maltodextrin-based niosome. J App Pharm Sci 2013; 3(7): 68-71. Wang M, Hao S, Andrew GC, Weifang Z, Yuzhu W, Quan CK and Honggang C: Synergistic antitumor activity of self-assembling camptothecin and Capecitabine hybrid prodrug for improved efficacy. J Contr Release 2017; 263: 102-111. Soleiman J, Babak N and Ali E: Colon cancer targeting using conjugates biomaterial 5-flurouracil. Biomedicine & Pharmacotherapy 2016; 84: 780-788. Goodman and Gilman: The pharmacological basis of therapeutics. 10th International edition; 1404-1405. Mohd Q, Ameeduzzafar, Syed SI, Javed A, Javed A and Asgar A: Formulation and optimization of lacidipine loaded niosomal gel for transdermal delivery: In-vitro characterization and in-vivo Biomedicine & Pharmacotherapy 2017; 93: 255-266. Ankit AK and Akhlesh KS: Development and optimization of mucoadhesive nanoparticles of acyclovir using the design of experiments approach. J Microencapsul 2015; 32(6): 521-532. Ahmed MS, Afaf AR, Amal SM, Abu ELE and Yasmin IMM: Formulation and optimization of itraconazole proniosomes using box behnken design. Int J App Pharm 2018; 10(2): 41-51. Srikanth, Anand KY and Mallikarjuna SC: Design and optimization of Capecitabine proniosomes. Int J Pharm Res Health Sci 2018; 6 (4): 2717-2722. Srikanth, Anand KY and Mallikarjuna SC: Preparation and evaluation of maltodextrin based proniosomes containing capecitabine. Int J Res Dev Pharm L Sci 2017; 6(7): 2856-2861. New RRC: Liposomes, a Practical Approach. Oxford University press, New York 1990: 80. Srikanth, Anand KY and Mallikarjuna SC: Development and validation of New UV spectroscopic methods for the estimation of capecitabine in bulk and formulations. Eur J Pharm Med Res 2017; 4(9): 692-701. Srikanth, Kumar YA and Setty CM: Design and optimization of Capecitabine niosomes derived from proniosomes. Int J Pharm Sci & Res 2019; 10(4): 1804-10. doi: 10.13040/IJPSR.0975-8232.10(4).1804-10. Authors Address: Jawaharlal Nehru Technological University (JNTU), Hyderabad, Telangana, India.